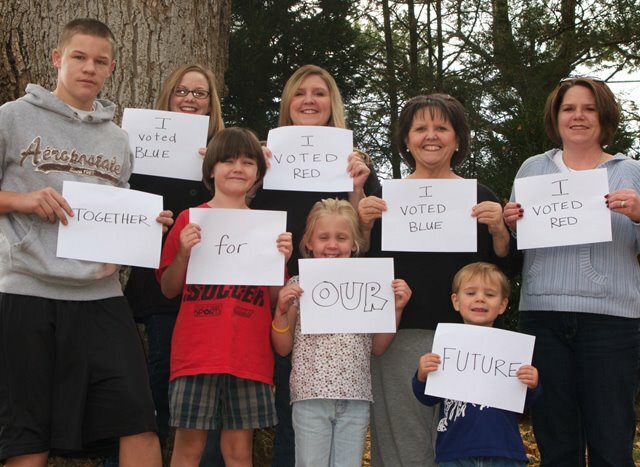 > I happen to be in one of those extended families that looks purple when you put us together in terms of the past election, so when I ran across this blogger’s project to bring such families together after the election I thought it was worth sharing. with simple messages to be e-mailed his way that could break down the barriers. “Perhaps it is naive. the differences are real, I know. but we have to repair the damage done from this election cycle somehow…,” he said. Good for ZeFrank. Good for family divisions over politics. Good for America. What he didn’t expect perhaps, were pics to come in from the 48 back to the 52, and for many divided families to show their love and shout-outs to their own extended families. Here is the actual website with the many submissions coming in from all over. There are numerous pages of pics, so if you want to keep browsing, just scroll to the bottom and go to the other pages. >seven-eleven used to sell slurpies– I am so glad it has left the arena of a sugar drink and become a political theory. But for me it still feel to sweet.